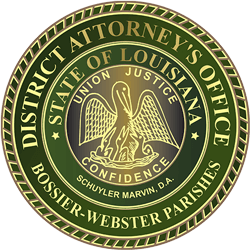 In 1996, the Louisiana Legislature enacted Revised Statute 16:17, which created the position of Victim Assistance Coordinator within the office of the District Attorney. With the creation of this position, victims have a professional in the DA’s Office whose job it is to ensure that victims’ rights are honored. The coordinator is an advocate for the rights of victims both in the courtroom and in the office. Most importantly, the Victim Assistance Coordinator program is an integral part of the effective and efficient prosecution of criminals. The coordinator will ensure that the victims’ rights are honored and that victims are treated with dignity and respect. The Victim Assistance Coordinator also acts as a liaison between the prosecutor and the victim. The coordinator not only keeps the victim aware of upcoming court proceedings, but explains the proceedings to the victim. In addition to these services, the Victim Assistant Coordinator can assist victims in completing a victim impact statement and provide referrals to community-based programs for financial and emotional support. These services are provided at no cost as a public service by the Office of the 26th Judicial District Attorney. Please feel free to contact our Victim Assistance Coordinator in your parish. The right to reasonable notice, to be present, and to be heard (Victim Impact Statement) during all critical stages of the proceedings. The right to be informed upon the release from custody or the escape of the offender. The right to review and comment upon the presentence report prior to imposition of sentence. The right to seek restitution from the accused or from the Crime Victim’s Reparation Fund (if eligible). The right to a reasonably prompt conclusion of the case. These rights may be exercised by victims of any homicide, felony offense, sexual offense or vehicular negligent injuring. TO ENSURE YOUR RIGHTS AS A VICTIM YOU MUST FILE! If you are a victim and wish to receive notices, you should obtain a “Victim Notice and Registration Form” from the law enforcement officer investigating your case. Once you complete the Victim Notice Form, the law enforcement agency will forward it along with the case report to the District Attorney’s Office. The Victim Notice Form will then be forwarded to the Clerk of Court when charges are formally filed against the defendant. The Victim Assistance Program coordinator in your parish can assist you with this, if necessary. Additionally, you should register with the Louisiana Automated Victim Notification System (LAVNS) by calling 1-866-528-6748 or clicking here.